Spring will hopefully be upon us soon. Congratulations to you and your pets for surviving the longest winter EVER! With the coming of spring, comes an increase in toxins, diarrhea and itchies. Be on the lookout for these things in your pets! Everything, including parasites, poisonous plants, and preposterous allergens, seems to wake up in the spring! Azaleas, lilies and tulips are among the list of cat poisons and Hyacinths, azaleas and daffodils are among the dog list of poisons. This is just a sample of the spring plants that can be toxic. Toxic plants can make your pet very sick and even cause death. The Easter Bunny also brings toxic chocolate into your house, so please keep those Easter baskets out of reach from your dogs! As the ground thaws and the rains come, the ground will turn into a mushy, parasite- inviting mess. Giardia and other intestinal parasites like the moisture, and as your pets clean their muddy paws, they can easily pick up intestinal parasites! 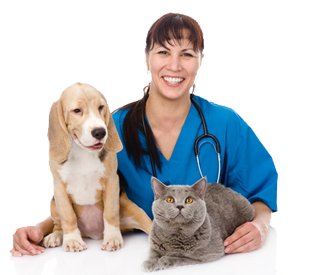 Intestinal parasites, some of which people can contract from their pets, are totally treatable! They can cause weight loss and diarrhea…..yuck! Who wants to deal with that? We do. If you suspect parasites in your pet, please bring your pet in for a visit with us. Don’t forget to bring us a fresh sample of poo! Parasites aren’t the only nasty diarrhea-causing problem of spring. We also see a rise in parvovirus cases. Parvo is a deadly virus that lives in dog poop of infected animals. It is very hardy and can live up to 7 months in contaminated soil. The virus destroys the lining of the bowels causing horrific secondary infections. The chance of survival is best if a diagnosis is made early. Signs of parvo include vomiting and diarrhea. Prime places to pick up the virus include puppy parks or other places where dogs congregate, but that doesn’t mean your dog can’t catch it during a spring stroll around the block. The best news about this disease…….IT IS 100% PREVENTABLE WITH COMPLETE VACCINATION!!! This means a full series of puppy shots every few weeks until your puppy is 4 months old and then yearly follow-up booster shots! Have you been sneezing and watery-eyed since the grass has started to green up and the buds are forming on the trees? Pets can have allergies just like you! If your dog or cat is scratching so much it is making you crazy too, it is definitely time to come see us. We have so many options for treating allergies and itching. We will soon be carrying Apoquel, a new, steroid-free medication that stops all that itching! Fleas can also contribute to itching, so be on the lookout for those pesky critters! The best way to keep your pet flea free is with a monthly flea prevention program. We carry all sorts of these, both oral and topical! With spring, also comes mosquitoes, and you can expect to see more than ever this year! Bats are one of the primary predators of mosquitoes and the bat population is suffering a decline due to a nasty fungal disease that they are contracting. So, more mosquitoes means more potential heartworm carriers. Heartworm causes fatal disease if untreated. Both dogs and cats are susceptible to heartworm. We strongly recommend year-round heartworm prevention for both dogs and cats. For cats, this means monthly Revolution. For dogs, we have more options available: topical, oral and soon the six month injectable, Proheart. We also recommend yearly heartworm testing in dogs. The last bugs we worry about in spring are ticks! Aren’t they gross little blood suckers? Not only are they gross, they are prolific disease spreaders. They spread diseases such as Lyme and Ehrlichia. Topical tick prevention and Lyme disease vaccines are now available! The tick preventatives also get fleas, so more bang for your buck! So there you have it, a plethora of spring threats. It seems like after reading this, you should want to beg winter to come back. How about instead of that, you just ask us to help you prevent all these things, so that you and your pets can enjoy your spring together!